"Tak is the best sort of game: simple in its rules, complex in its strategy. Bredon beat me handily in all five games we played, but I am proud to say that he never beat me the same way twice". 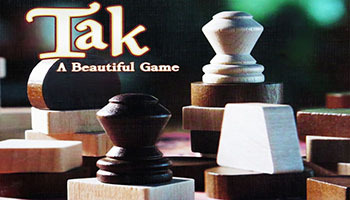 At first, Tak was intriguing but imaginary. Then in 2015, Patrick Rothfuss worked with James Ernest to make it real. Welcome to Tak: A Beautiful Game. "My next several hours were spent learning how to play tak. Even if I had not been nearly mad with idleness, I would have enjoyed it. 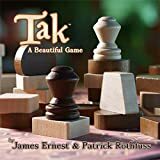 Tak is a two-player abstract strategy game dreamed up by Pat Rothfuss in "The Wise Man's Fear" and made reality by James Ernest. In Tak, players attempt to make a road of their pieces connecting two opposite sides of the board. There are two types of Tak piece: stones and capstones. Stones can be played in two ways: flat or standing. Flat Stones: Usually, stones are played flat, as shown here. Flat stones can stack, and they can count as part of a road.